Do you find that your skin is looking dry and dull? This is very common with a season change and environmental changes so I (Jessie) went looking for the perfect skincare remedy to restore PH balance. I’ve always been a skincare junkie trying new brands as it’s always good to switch your product every 3-6 months to trick your skin (same with shampoo/conditioners). I have always been hesitant to try Shoppers Drug Mart brands but decided to give Loreal a go—and I was impressed. 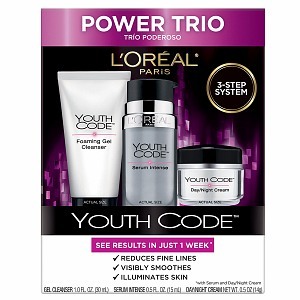 I bought the Youth Code starter kit which came with a foaming gel cleanser, a day/night cream and an intense serum. The cleanser removes impurities and gently exfoliates to reveal smooth and luminous skin. The intense serum instantly hydrates and illuminates your skin followed by applying the day/night cream that hydrates and delivers an instant smoothing action. This kit is a punch to fight the first signs of aging skin and is around $35.00. I highly recommend.